There’s a blatant switcheroo that Seth (and almost everyone else) makes when explaining the Long Tail. In pocket #1 of the curve, Seth talks in terms of a creator of a work. In pocket #2 of the curve, he also talks in terms of the creator. But then when he gets to the long tail, he switches away from a creator, to talk in terms of an aggregator of other creators’ work. Why is that? What happens to the creator? The creator is dropped when we get to the long tail “pocket of profit” because the long tail is not profitable for the creator. It’s profitable only for the audience and aggregators. I’m not really sure the “fractal long tail which operates within a long tail” (every subject has its own long tail) mentioned in Seth’s previous post helps a whole lot either, other than to say you want to be as close to the head as possible even in your niche. That is a no brainer. Being an aggregator is not an option either for a creator. Almost no creators I know are productive enough to create sufficient quantity of new things to aggregate their own work. Aggregators are by definition not creators. So as one crosses the sections — going from the short head to the long tail — one should be consistent and view it from the aggregator’s point of view or the creator’s point of view. I think it is a mistake to conflate the two view points. I’ve been wrestling with this for a while and I think the only advantage to the creator that I can see in the long tail is that aggregators can invent or produce a long tail domain that was not present before. Like Seth’s Squidoo does. Before Squidoo or Amazon or Netflix came along there was no market at all for many of the creations they now distribute. The proposition that long tail aggregators can offer to creators is profound, but simple: you have a choice between a itsy bitsy niche audience (with nano profits) or no audience at all. Before the LT was expanded your masterpiece on breeding salt water aquarium fishes from the Red Sea would have no paying fans. Now you have maybe 100. One hundred readers/watchers/listeners is not economical. There is no business equation that can sustain profits for continual creation from so few buyers. (It can of course support the business of aggregation above the level of creation.) But the long tail niche creation operates perfectly well in the realm of passion, enthusiasm, obsession, curiosity, peerage, love, and the gift economy. In the exchange of psychic energy, encouragement, meaning of life, and reasons to live, the long now is a boon. That is not true about profits. Economically, the more the long tail expands, the more stuff there is to compete with our limited attention as an audience, the more difficult it is for a creator to sell profitably. Or, the longer the tail, the worse for sales. But if we view the long tail as a market of a different type, as a market of enthusiasm and connection, then as the long tail expands, this increases the chance of two enthusiasts meeting, and so the longer the tail, the better. 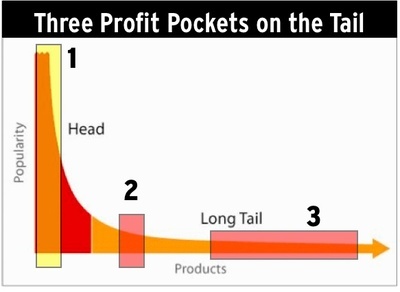 The first two pockets of the curve are trying to maximize profits; the last pocket of the long tail is trying to maximize passion and connectivity. There is one further indirect advantage to the long tail. Since your creation now exists in a market (where it would not have existed at all before) it can, if you are lucky, start to migrate uptail. With creativity you may be able to move your creation out of the economic doldrums of the long tail up into section #2, where 1,000 true fans and other mid-level success lies. As I argue in 1,000 True Fans, this is where you want to be as a creator. Seth calls it the pocket of ” the profitable, successful niche product” and I agree with him that this pocket #2 rather than pocket #1 is where you want to aim for. But if you fairly evaluate section #3 according to the same metrics as section #1 and #2 — the dollar value to the creator — then the long tail is a desert for profits. It makes sense to pursue this pocket only if you switch. You must switch in pocket #3 either to looking at it from the perspective of an overlord aggregator, OR, you need to switch to looking at this territory as an alternative economy, one that is not running on the dollar. A new region with its own dynamics. In other words, Squidoo and Amazon and Netflix make the profitable long tail very happy. But happy long tail does not make happy creator. I prefer to think of the Long Tail as being a tail to a different animal. We’ve misidentified the intangible being it belongs to. It is not the long tail of the Beast of Commercial Profits. Rather it is the long tail of the Dragon of Love. The love of creating, of making, of connecting, of unreasonable passion, or making a difference, or doing something that matters to ourselves, the love of connecting, giving, learning, producing, and sharing. It is important to know which tail we are wagging. One thing I’d like to see is some numbers associated with these pockets and/or tails. Famously, no one knows what the Amazon ranking (for books, music, etc.) means for your actual sales numbers, though you can do some tests to extrapolate what it might mean. I find it extremely valuable as a world/latin jazz musician to know whether in my niche I should be aiming for 10,000 CDs sold or less than 2,000? How about downloads? When I was a magazine editor I first helmed a magazine that reached 10,000 Latin American readers, then another that reached 100,000 Americans in the software field. Circulation is often an arbitrary choice based on your competition and making a good story for advertisers. I was surprised to learn that computer book print runs in the early part of this decade were only a couple thousand — a computer book that sold 5,000 copies was a best seller, I believe (it’s probably lower now). The point is, in every niche there’s got to be a sense of the size of the market, and I think that’s what bothers me about these very generic long tail discussions. Great article! Thank you for writing it up. So great, in fact, that I’ve translated it to Dutch, please see http://aardbron.nl/2008/08/01/kwispel-de-langstaart-der-liefde/. I noted Seth’s switcheroo as well. The long tail is a great concept that can only be used if you can build a site that has sufficient content that is unique enough to prevent the duplicate content taboo. There is only one offering that I know of that can actually and very affordably optimize all mls listings in the mls data base for the unique long tail searches as well as automatically put them on my web site. This gives me thousands of pages that are all unique and optimized for the long tail. The long tail is a great concept but must be well thought out and implemented to gain any chance of having any internet visibility without going downt he paths of paid placement, pay for clicks or extremely expensive optimization options. Take a look at mls4az.com and see a site that truly does use the long tail technology. For us poor working realtors, visibility is the name of the game. There are some clothing designers who make small batches of clothes that are never the same. Also, is it possible in the future that a product can be customized for each individual so that it extends down the long tail? Only a few of each item that is made, but the producer is able to create an endless variety of products based on his/her unique assets and capabilities. Maybe the problem with commercialism is that we think too much about being â€œcommercialâ€ for the masses. Fascinating. I am a creator AND an aggregator as you can see from my website (I’ve written 3 of the 20 or so books I sell). Right now I am teetering on the decision of whether to continue as creator (my books are in tail #2) or aggregator (most of these products are in tail #3). What I have done to date is use the popularity of my tail #2 creations to send people to purchase my tail #3 aggregated products which I did not create. Isn’t mass ( or lot less than mass )customization a way for the creator to make a profit on the long tail? Example: there are some clothing designers who make small batches of clothes that are never the same. Also, is it possible in the future that a product can be customized for each individual so that it extends down the long tail? Only a few of each item that is made, but the producer is able to create an endless variety of products based on his/her unique assets and capabilities. Maybe the problem with commercialism is that we think too much about being “commercial” for the masses. What ever happened to the master samurai sword makers? Jimmy Choo does a pretty good job with his shoes. Kevin, thanks for your inspiring piece, which reached me courtesy of Chris Andersons blog and Google Reader. As you say, if niches can be pooled sufficiently well by aggregators, they will also open new doors to their audiences/markets. BUT, contrary to common belief, pricing can be different in these niche domains, that what has been possible with the current architectures (dominated by the tyranny of PageRank). When I meet a customer who wants to have one of my documentary films, I can ask almost any price, because this customer is eager to get my product, and can’t get it anywhere else, cheaper. As long as the level of convenience in the architecture is there, products are made known to their markets, and there is an actual need for these particular products, pricing can gain much more appropriate levels to support the producer. Therefore these niche domains (I’m not talking about Squidoo pages here) which contain rich context and meaningful products which are valued by their market, may do financially well enough to support aggregators as well as producers. What matters is architectures of aggregation and visibility, which connects niche markets more precisely with niche products. I invite you to take a look at our blog http://www.kaplak.com/blog/ with more on these problems. Look at the highly specialized industry newsletters (e.g., major airline aircraft maintenance regulations, food inspection test methodologies). There are thousands of them, and they’ve been successful for years. Each may have only a hundred or so subscribers, and correspondingly stratospheric rates. My guess is there are many more of these specialty niches nowadays being successfully exploited by experts with a much greater reach to their audiences and a much lower cost of publication. That’s what LT means to me: aggregators aren’t needed when an activated audience can find its recondite content creator, and vice versa, without a lot of friction. excellent and valuable insight; thanks. Great post. One thing to note is that from the aggregator’s point of view, the real advantage of stocking up the long tail is that it produces some surprise hits which together produce more of a profit than any losses at the end of the tail. Unfortunately, when analyzing the data, researchers look at the tail as being “the less successful set of dvds/books/movies”, and hence miss out these surprise hits which really started out in the tail but have moved out. Your comments are spot on, it is tough for the niche creator to make a go of it. However I am noticing that with the huge increase of aggregators that the niche creators are starting to have choices of who and how many channels to distribute through. In my industry the creators are placing their items in dozens of distribution channels for all kinds of different prices and in turn, from what I can tell, they are making a fairly steady income from the tiny amounts that trickle in from many sources. Musicians and bands can now place their music on hundreds of distributions channels through single companies, some of them only asking 15% of the revenue. I think it is a great environment for aggregators but it is also becoming a much better one for the long tail creator as hundreds of aggregators start asking for their content. No matter which tricks I try, I just cannot send pings from blogger. I posted this on Anderson’s blog so I figured I would post it here as well. I’m going to disagree with some of this. If you as a long-tail creator spend an hour on something and then sell it to 100 people at $5, then you are looking at $500 per hour. That is the real power of the long tail. Creators of any sort (artists, writers, musicians, etc.) don’t need to spend 40 hours per week dedicated to a job. They can create pieces that appeal to niche markets (1 market, 2 markets, 50 markets), and sell to each of those markets.